Last week I wrote a post criticizing Fed chair Janet Yellen for apparently becoming a “stock picker“. Later later in the week she spoke before the US House Financial Services Committee in Washington she seemed to tone down a bit her “stock picking” comments, but she nonetheless commented on the general valuation of the US stock market. I am still critical about the idea that the Fed has a view at all on the valuation of the US stock market, but lets for a second forget that and instead address the issue of US stock market valuation. I am certainly no equity analyst and the normal disclaimer applies – this is not investment advice. This is an quasi-academic excise. Last week Yellen said that in her assessment US asset values “aren’t out of line with norms“. Said in another way – the US stock market is basically fairly valued. Equity strategists and investors have many different methods to evaluate stock market valuation. An often used method is what has become known as the so-called Fed-model (named by the legendary equity strategist Ed Yardeni). The Fed-model basically says that there is a close historical relationship between the so-called earnings yield (the inverse of the P/E ratio) and US Treasury bond yields. While there certainly is good theoretical reason to discuss the model there is no doubt that over time the “model” as fitted the development in the US stock market fairly. I will here use a slightly altered version of the Fed-model. Instead of using the earning yields I look at the ratio between on the one hand Private consumption expenditure (as a monthly proxy for nominal spending/NGDP) and stock prices (I use the Wilshire 5000 index here). I compare that not with US Treasury yields but instead with the yield on Aaa corporate bonds. I have “calibrated” my “earnings yield” (PCE/Wilshire5000) so it is in January 1980 was exactly equal to the corporate bond yield. This obviously is an ad hoc assumption, but it ensures that the average “valuation” of the stock markets is more or less zero for the period since 1975. 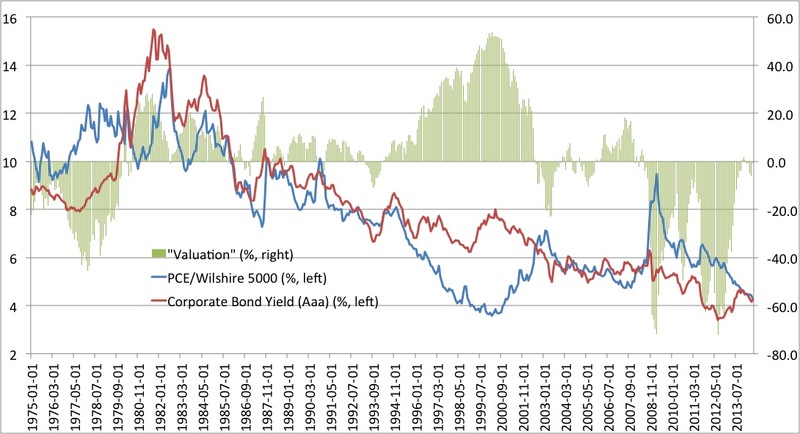 The graph below shows that there is a quite close historical correlation between the “earnings yield” and the yield on US corporate bonds. 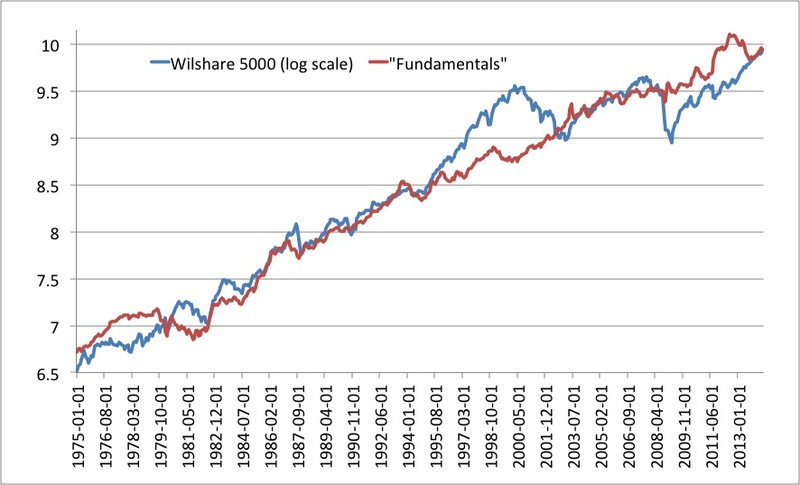 We can show basically the same thing by looking at the Wilshire 5000 in level versus what I below call “fundamentals”. “Fundamentals” I here define as the ratio of Private Consumption Expenditure to the corporate bond yield. Also here I have calibrated the “model” so January 1980 is our “starting point”. Both graphs above illustrate Yellen’s argument that stocks are not overvalued. In fact US stock prices exactly seem to reflect “fundamentals” – at least if we use my version of the Fed-model. Some central bankers and a lot of internet-Austrians are eager to claim that the development in stock prices since 2009 in some way reflect monetary policy “manipulation” of the stock market. Obviously we cannot understand the development in stock prices without understanding monetary policy, but there is nothing “unnatural” about what have happened and as the graphs above illustrates it doesn’t really look like there is a US stock market bubble. In fact we can use the Fed-model to explain the development in stock prices fairly well since Wilshire 5000 hit rock bottom in 2009. Since then Private Consumption Expenditure has rebounded and Corporate bond yields have come down. Both factors are obviously bullish for stock prices according to my adjusted Fed-model. Furthermore, stocks became significantly undervalued in 2008-9 and this in fact seems to most important in terms of the stock market valuation. Looking at the adjusted Fed-model Wilshire 5000 is now basically at “fair value” levels. So going forward we need either to see Private Consumption Expenditure to increase or Corporate bond yields to drop to see further (fundamentally driven) stock market gains. I should again stress that this is not the work of an equity strategist and I am not providing investment advice here. My only concern is to discuss whether or not we can say that actions from the Federal Reserve have manipulated stock prices in such away that we can say there is a bubble in the US stock market. Famously Irving Fisher shortly before the stock market crashed in 1929 announced that the US stock market had reached “a permanently high plateau”. I might be repeating this mistake by argueing that we are now basically trading at “fair value” levels for the US stock. So let me hedge my position (quite) a bit – unless the Federal Reserve will make another policy mistake then US stocks are at a permanently high plateau. Other central banks like the PBoC or the ECB might also very well mess up things. And yes monetary policy failure is the biggest risk at the moment as I see it. The US economy is in recovery, stock prices continue to inch up and financial market volatility is low. Why? Exactly because monetary policy in the US in general has returned to what Bob Hetzel has called a Lean-Against-the-Wind with credibility-regime. While Fed policy is far from perfect we broadly-speaking can say the Fed has returned to a (quasi) rule-based monetary policy where the markets in general are able to predict changes to the monetary policy stance. If anything the Fed is probably expected to deliver 4% nominal GDP growth – and this is exactly what the Fed has done in recent years. However, if the Fed for some reason where to change cause (or change the implicit target) for example because it is becoming preoccupied with asset prices as in 1928-29 we could see the Fed trigger a negative shock to the US economy and that surely would send the US stock market down. I have a dozen or so indicators or models that I use to evaluate the markets, one of them is my variant of the Fed model. Almost all of my indicators say the equity markets will continue to rise and are close to fairly valued. There are two indicators that are extreme and in opposing directions. One is the extremely positive effect of monetary policy and dollar denominated investment from abroad, the other is the extremely negative effect of high “liquidity preference” from a lot of cash sitting on the sideline that got out in 2009 and never got back in. I think what will drive valuations one way or another will be whichever of these two opposing forces wins. Personally I predict that as markets keep going up, people on the sidelines will chase returns, and push it into a possible bubble after the S&P500 gets above 2,200 over the next couple years. The first consideration is that European and global asset prices have already become largely disconnected from underlying economic fundamentals as a result of the unprecedented expansion of the Federal Reserve and the Bank of Japan’s balance sheets. We can imagine a situation where REAL GDP grows, while inflation is zero. In that scenario nominal GDP growth will be equal real GDP. I believe that the stock market basically should increase in line with NGDP growth over time (at unchanged interest rates). So if the Fed ensure for example 4% nominal GDP growth over time – then I would expect stocks to rise more or less at the same rate over longer periods. So basically the reason why right now stock prices are rising and consumer prices are not, is that more stuff is being produced? Not so boring as an FX strategist! If we were in such a wonderland, the chief determinants of stock returns would be new information (i.e. rewarding deeper/more creative research) and expectations for individual industries, rather than the risk of left tail monetary policy failure. Stock fundamentals? Let’s see: Dividends, E(Dgrowth), E(Volatility of said Cash Flows), Equity risk premium, a.s.o.